Make Halloween Awesome And Fun Again! I have spent too much time writing about things that I don’t like. Admittedly, I am human and prone to fits of anger and angst just like any of you. BUT, I am also a superhero and a living legend and avatar of candy and smiles! Well, in my mind it’s true anyway. So we all know that all the holidays have been beaten down into the mud by corporate America. I say it’s high time we fight back! Take our FUN back! They wanna make it all about the money? Let’s see if we can make them WORK for it! Dress up in a costume you made and go out in it! That’s right, I’m talking about all out lunacy here. I’m talking about putting together a costume made out of nothing but recycled materials and some makeup you ALREADY have lying about. Get downright SILLY! Be a television, all it takes is an old cardboard box and some paint! How about wrapping yourself in toilet paper and/or shaving cream and going as a “trick”? The point is to make it FUN again and to not pay a big greedy company for their shoddy imported crapstumes. Get in your costume and go walk around, go do the things you normally do, but do it with SILLY! Get a young relative and go reverse trick or treating at a hospital! Oh wait, you think I’m kidding? Why would I kid about something simple and fun? I mean it, get your homemade costume on and go give out candy at a hospital! Think about it this way, if YOU were stuck there and someone came in with a costumed child who said “trick or treat!” and then they gave you a piece of candy? How cool would that be? Take the same mini-you and go trick or treating like we used to. Hit every house! Knock on some doors and smile at your neighbors! If possible, insist that your neighbors be in costume also. careful not to let things get ugly though. Some people just don’t understand fun. 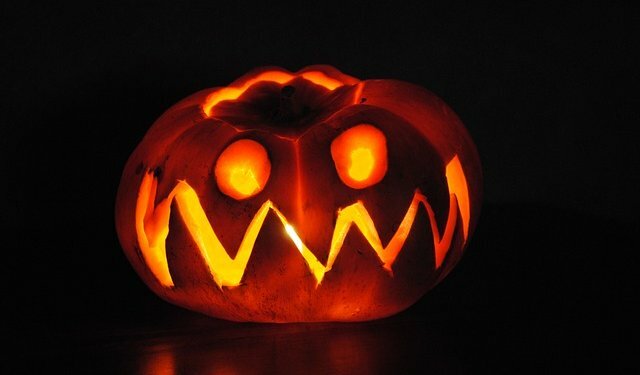 Carve the UGLIEST jack o lantern that you are capable of. If you aren’t the crafty type, just hack a few holes in a pumpkin with a machete. Drape the insides on yourself and display your “victim” proudly! Instant Axe Murderer costume, BONUS points! Don’t forget the candle! Have a hose handy and INVITE the local angsty teens to egg your car. If they decide to get snarky and egg the house, HOSE ‘em. Or throw pumpkin guts at them, they can handle it. Sit on your porch eating candy out of a jack o lantern. Scatter a cheap costume onto the front steps and spatter some cheap red watercolor over the costume bits. GRIN at anyone who walks up.